Although these women’s ugly Christmas sweater hoodies fall under the classification of ugly Christmas sweaters, most of them really belong in the “Not So Ugly” category. Some of them are funny but most are quite nice looking and you could wear them not only to an Ugly Christmas Sweater Party, but also throughout the holiday season and all through the colder months. 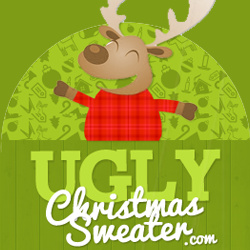 You’ll find traditional Fair Isle Christmas designs as well as other traditional ugly Christmas sweater designs. If you like the ugly Christmas sweater hoodies on this page, you might also like Women’s Ugly Christmas Sweater Jackets. Aren’t these Christmas hooded sweatshirts pretty? Customer reviews indicate that people are very happy with this sweater. They say it’s beautiful, cozy, soft, warm, and they get a lot of compliments on it. The only caveat is that it runs small so be sure to order a larger size than what you usually wear. There are a couple other colors. Click on one of the hoodies to go to Pink Queen and look at the other colors. If you decide on one of the cute cat or dog hoodies here, be advised that they run small. Be sure to order up a size. Customers say they love these hoodies because they’re colorful and go with a lot of different pants. Also they’re unique, bright, cheery, and they like to give them for gifts. On the more humorous side, we have the elf hoodies. Choose red or green. Customer reviews say that they are cute, of good quality, and run true to size. Very cute for an Ugly Christmas Sweater Party. These beautiful Fair Isle hoodies are a cotton blend and come in five colors. (Dark gray is not pictured). They look so warm with a furry lined hood. Great for daily wear all winter. These three ugly Christmas sweater hoodies all come in other colors. If you’re interested in seeing the other colors, just click on the sweater you like and you’ll be able to see all the colors.